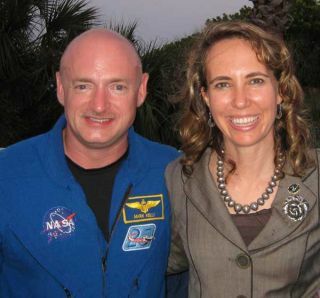 It's official: Mark Kelly, astronaut husband of wounded Congresswoman Gabrielle Giffords, will keep his seat on the space shuttle Endeavour's final flight in April – a mission he will also command. Kelly had been debating whether to go through with the mission or stay by his wife's side as she recovers. Giffords was shot in the head Jan. 8 at a constituent meeting at a Tucson, Ariz., grocery store. Since Jan. 21, she has been undergoing rehab at a hospital in Houston. "I feel very confident that I made the right decision not only for me, but for my crew members, my family and for my wife," Kelly said during a press conference Friday (Feb. 4) to announce his choice to rejoin the mission. He appeared at the conference wearing a blue rubber wristband with a peace sign, a heart and the word "Gabby" on it, which he said stands for "Peace, Love, Gabby." Kelly, 46, will command the STS-134 mission of Endeavour, due to launch April 19 from NASA's Kennedy Space Center in Cape Canaveral, Fla. He will lead five other astronauts on a two-week mission to deliver an astrophysics experiment and new hardware to the International Space Station. NASA expressed full confidence that Kelly would be able to handle the mission. "We think this is a very doable thing, and it is the best thing for our mission to have Mark be the commander," said Peggy Whitson, chief of the astronaut office at NASA's Johnson Space Center in Houston. Kelly outlined the long process of coming to this decision. At first, after the shooting, he assumed he was not going to fly on STS-134. "I even said, 'I'm pretty sure I'm done,' 'cause my expectation was she was going to be in an ICU for months in Tucson," Kelly said. "Things fell into place and she improved very fast, so the decision became easier over time. I obviously weighed the time that I can spend with her with what I think is in the best interest of NASA and my crew." Kelly said the fact that Giffords now has a very busy schedule, with many hours of rehab every day, was key to making the decision. Also of utmost importance was what Giffords would have wanted. "I know my wife very well and I know what she would want and so that makes the decision easier," Kelly said. He said he also took into account the risk he would be taking in flying into space at this time, but determined it was worth it. "Spaceflight is a risky business," Kelly said. "Apparently so is being a member of Congress. From my perspective I've always evaluated the risk with what the benefit is. I really value what NASA does. If something happened to me, how that would affect her – that was part of what I considered, and ultimately what I decided was the right thing for me to do was to return and fly STS-134." Kelly said his wife was making amazing progress in recovery, but did not go into details about her condition or prognosis, citing privacy concerns. "She improves every day," he said. "Her rehab doctors are just incredibly impressed with her progress and the fact that the slope of that curve is really steep." In fact, she's doing so well the plan is for her to attend her husband's liftoff in April. "I have every intention that she'll be there for the launch," Kelly said. "I've already talked to her doctors about it. There really shouldn't be any reason that she can't go to the launch." Following Giffords' shooting, NASA appointed a backup commander, veteran astronaut Rick Sturckow, to train with the crew in Kelly's place. Now Kelly will take over those duties again and resume his full schedule training with the crew on Monday (Feb. 7). "We are glad to have Mark back," Whitson said in a NASA statement released before the press conference. "He is a veteran shuttle commander and knows well the demands of the job. We are confident in his ability to successfully lead this mission, and I know I speak for all of NASA in saying 'welcome back'"
Endeavour's mission is the second-to-last space shuttle flight planned before NASA retires its three-orbiter fleet. Kelly has already flown on three previous shuttle trips. Kelly's twin brother, Scott Kelly, is also an astronaut and is currently living in space aboard the International Space Station. The two brothers discussed the situation while Mark Kelly was weighing his decision. "We do talk about it and we have talked about the different considerations," Scott Kelly told reporters Wednesday (Feb. 2). "I'm confident he's going to make a good decision, and whichever decision he chooses I'll support him." Scott Kelly is due to land back on Earth March 19, a month before his brother will launch on Endeavour. "It'll be good to have him back and he's already told me he wants to be as helpful as possible," Mark Kelly said. Both brothers are captains in the U.S. Navy and were selected as NASA astronauts in 1996. Robert Pearlman, editor of collectSPACE.com, a SPACE.com partner site, contributed to this report.